A common requirement when exporting data to a MS SQL Server database is to stamp the exported row (record) with a date-time stamp. DBAs will often use this information when they analyze the data. Another similar requirement is to export an existing date and time fields from a UniData/UniVerse record to a single datetime column in a SQL Server database. This tech tip will show you how to setup your Export Specifications to use date-time stamps and what you need to do to export existing date and time stamps fields that exist in your UniData/UniVerse Database. These techniques will work using either Kourier Integrator or Kourier Integrator Classic. We'll start with the simplest example, adding a date-time stamp to an exported row. Note, this tip was first published in our Summer 2006 newsletter in an "Ask Kore" article. However, it's a very common question and for completeness it's being included here. Note: This must be uppercase, and don't forget to create a SQL datetime type column in your SQL database before running the export. 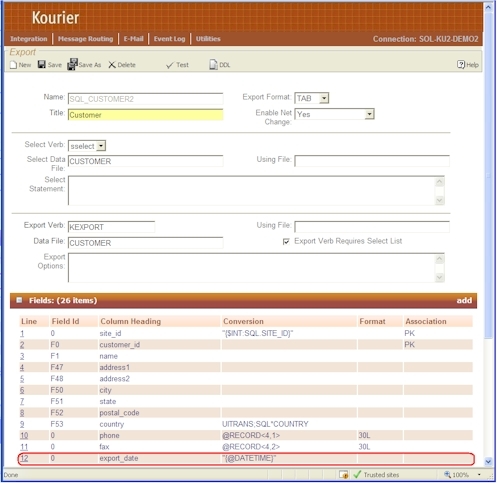 See the example Kourier Integrator for U2 Export Specifications screen below for how you could enter this. Best practice is to add the date-time stamps as the last exported field, but it can be anywhere actually. It's pretty much the same, except that we are using the "G" Group Extract conversion to separate out the 2nd and 3rd parts of the "*" delimited field. Using this dictionary on the record with the sample data above would give us the output "01/31/2008 14:33:57". Now for the really complex example. What about when you have MultiValued line items being exported to a child table in SQL, and you have date and time stamps as part of the line item information? Well, the OCONV function (and many other functions) will not work properly on MultiValued data. Similarly, the ":" operator for concatenation will not work on MultiValued data. Instead, we have to use the SUBR (Subroutine) functions provided in both UniData and Universe for this situation. It does mean that our formula will get longer and less readable. But we can still make it work! This will also tell you if you have made a mistake, like mis-counting the opening and closing parentheses (easy to do!). With all of these examples, you should be able to tackle almost any date/time structure found in your application. As always, of course, we are more than happy to assist you in building these I-descriptor dictionaries!